A strange sadness weighed on my heart as I stared at my Bible. Why wasn’t I excited about reading God’s Word? Alan and I had been reading the Bible in a year since 2005. Each year, we’d been amazed at how the Lord revealed Himself in new ways and used His Word to stretch and strengthen us at the perfect time. So, why was I struggling with focus? Why didn’t I feel that twinge of expectation and excitement when I prepared to start the year’s reading plan? When did I start losing sight of the immeasurable value of each God-breathed word in Scripture? As I beat myself up over the unanswered questions, the Lord patiently massaged my weary heart and prepared me for an unexpected answer. When I approach Bible reading as a task, I fail to acknowledge God intentionally provided and protected each word from the time of oracles through the years of transcription and translations so He could place His story at my fingertips. To the enemy’s delight, I’d fallen for the lie that made me skim through Scripture as if I had nothing left to learn from the same old story, as if I didn’t desperately need to listen to my loving Savior’s unchanging voice, as if I didn’t need Him to transform my heart with His words every single day of this life He’s given me. I prayed for forgiveness and asked God to ignite my passion for His Holy Word, to help me approach Scripture with a new and more grateful perspective, to strengthen me through the same old story that changed my life on December 14, 2001 . . . the day I surrendered my life to Jesus. In the beginning, before life as we know it started, God existed in all His triune perfection and decided to create something out of absolutely nothing. He designed and gave purpose to every galaxy, every planet, every star, every black hole, every atomic particle in the universe. The Lord created the heavens, in all its marvelous and mysterious vastness. He created the five basic elements of the universe. Fire. Wood. Water. Metal. Earth. From the nothing that existed, God created the earth. He created the inner core, the outer core, the earth’s mantle, and the solid crust that gives us firm places to stand. He decided where the land would separate the water, where vegetation would flourish, where desert sands would stretch across miles, where mountain ranges and valleys would be carved by trickling streams and the winds that answer to His voice alone. The Maker of time decided when this world would begin and when man would be created. 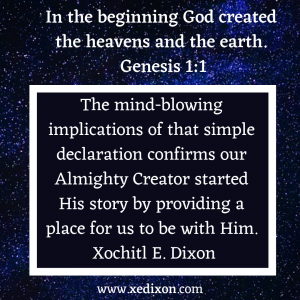 The mind-blowing implications of that simple declaration confirm our Almighty Creator started His story by providing a place for us to be with Him. Every God-breathed word preserved in the Bible assures us that we can depend on “the same old story” being the foundation of our faith and the proof of His unchanging and unconditional love. God’s unchanging story gives us confidence in the foundational truths on which He builds our faith. Why would we want God to change His perfection, to lead us along a different path so we won’t get bored? Why would we want Him to change His story, to shake things up so we could have a foundation we couldn’t depend on? Would we really want to follow Him if He was untrustworthy, if He kept changing the rules to fit our weaknesses? Why would He change anything? Why would we want Him to change anything? As I prepare to read the same old story this year, I’m now excited about the prospect of deepening my faith as He strengthens my confidence in His unchanging Word. I don’t want to miss one syllable. I don’t want to skim through one story. I don’t want to risk giving up an opportunity to hear His unchanging voice declaring His unconditional love for us. My attitude toward reading God’s Word was a direct result of The Fall. Like Adam and Eve, I listened to the enemy tempting me to doubt the value and surety of God’s unchanging words of truth and love. Did God really say this or that? How will we know if we don’t sit at His feet every day and invite Him to share the beautiful story He’s preserved for us in Scripture? Lord Almighty, thanks for blessing us with confidence in Your unchanging truth. Please ignite our passion for Your Word and help us understand Your truth as we sit at Your feet each day. Please forgive us for the moments we forget to truly hear what You are saying through Your words preserved in Scripture. We love You and praise You and thank You for the beautiful love letter You’ve placed in our hands‒the Bible. Please help us approach daily Scripture reading with grateful hearts surrendered in prayer and excitement at the opportunity to know You more. In what ways have you struggled with reading the Bible? How does considering the magnitude of the statement in Genesis 1:1 make reading God’s story more exciting? How has the Lord used His unchanging Word to change your life? I learned that lesson firsthand this week when I started physical therapy in hopes to strengthen my core and back muscles while waiting for another nerve ablation. I realized just how weak my upper body is when my therapist, Marea, introduced the first steps toward my slow healing process. But in that weakness, I also discovered a strength I had no idea still existed. Surprisingly, my muscle memory was still intact . . . somewhere deep under my extra layers of not-muscle. Her affirming words encouraged me to believe in the glimmer of hope that my strength could be renewed after over twenty years of debilitating pain and over compensation, which damaged other areas surrounding the original injury. After giving me a few exercises to work on at home, she reminded me that the healing process would be slow. So, I decided to accept her help, expect the inevitable setbacks, and embrace the pace required to build up what had been destroyed. Still, when my secret cravings for instant-gratification were denied, I struggled with discouragement. I fought frustration when my progress didn’t go as quickly as I’d hoped. I expected slow . . . but not too slow. I wrestled despair when it hurt to hope, when it ached my heart to endure another delay, when I began to doubt. What if physical therapy didn’t work? What if nothing worked? For years, I’d tried to protect my back from further injury and lived a hindered-life. My hurting body affected my relationships. And as I began to draw nearer to Christ, I sorrowfully admitted my relationships were damaged by my wounded spirit, too. I approached my physical healing the same way I often approach emotional or mental healing from hurtful words, from grief, from betrayal . . . the list goes on. I wanted to stop hurting, to get over it, to feel stronger, to be healed . . . immediately. Impatience nudged me toward discouragement, which threatened to drown me in despair. Past pain drove my decision-making process. Fear of pain, disappointment, and failure kept me from risking my hopes being dashed and tempted me to avoid the much-needed work that would strengthen me. I needed God’s help and the support of others, as I accepted that healing would take time and hoping could hurt when facing setbacks. The process wouldn’t be easy. The fix wouldn’t be quick . . . but the rewards are worthwhile now and in eternity. If I was going to persevere, I needed to place my hope in something bigger than physical, emotional, or mental healing. Because we have the power of Christ in us, we no longer have to live a hindered-life limited by our weak spots. True life, the only unhindered life, is “hidden with Christ in God” (v. 3). Our weakness withered away when the Lord washed away our sins by giving His life for us (vv. 5-6). When He rose again, He empowered us to thrive in freedom, no matter what our circumstances. 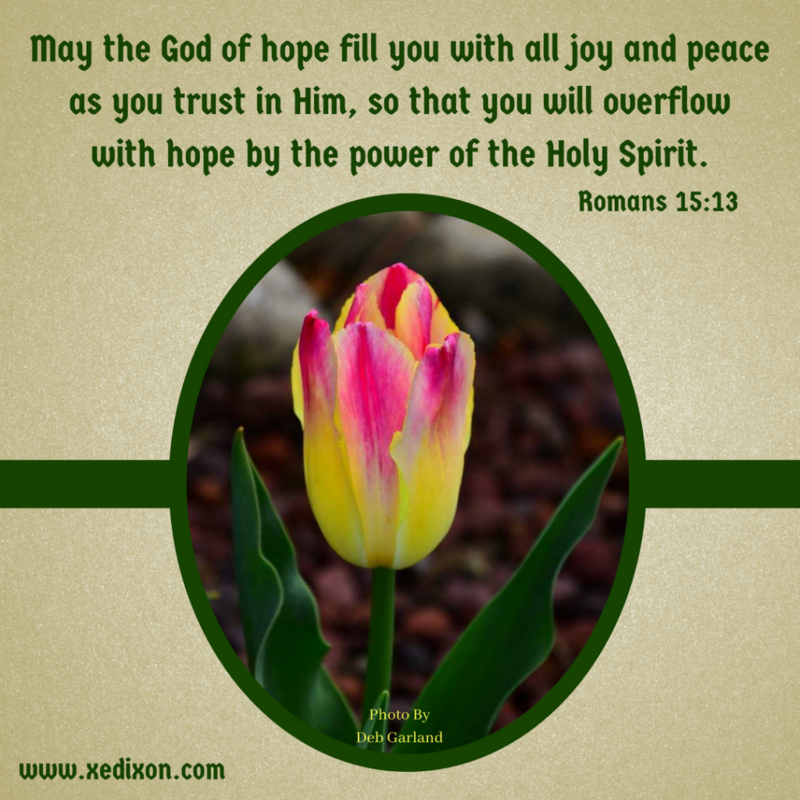 Jesus holds the answers we need, the peace we long for, the hope we desperately seek. When He appears again, we will be with Him in glory. Our hope is wrapped in assurance, in the promise that fuels the persevering faith we’ll need if we’re going to walk away from the life we lived before Jesus (vv. 7-8). As we ask God to help us nurture healthy relationships with Him and others, He frees us from our old ways of thinking. We can grow stronger as we’re immersed in our “knowledge” of the Creator of our “new self,” our no-longer-self-centered self, our no-longer-alone self, our no-longer-controlled-by pain-or-fear self (vv. 9-11). “Therefore, as God’s chosen people, holy and dearly loved,” we’re no longer controlled or limited by how we feel physically, emotionally, or mentally. This doesn’t mean our feelings aren’t valid. The Lord never minimizes our feelings. He only affirms we don’t need to allow feelings to drive our actions or determine how we interact with others. We can choose to be kind to others, forgive others, and love others (vv. 12-14), even when they don’t choose to be kind, forgive, or love us. We can live at peace with others and at peace with ourselves, be thankful and content . . . no matter what our circumstances (v. 15). We can nurture heart-deep joy as we encourage one another and intercede for others as we point each other to Jesus (v. 16). “And whatever [we] do, whether in word or deed,” we can “do it all in the name of the Lord Jesus, giving thanks to God the Father through Him” (v. 17). 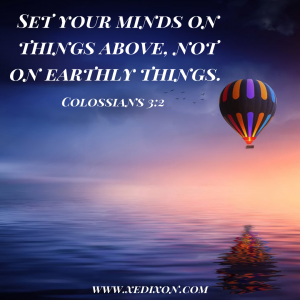 As we focus on things above, seeing beyond ourselves, we can recognize how small our biggest mountains are in comparison to the bigness of God. We can begin to understand how we’re all connected, how every one of us makes a difference in the lives of others, how our trials can actually be used for good as God grows us spiritually and uses us for His glory. We can sharpen our Kingdom Vision and learn to trust He’s working in and through all things for the good of all who love Him . . . not just us, but all people . . . even those we don’t know, agree with, or understand. And as we surrender each moment of our slow-as-He-determines healing journey to our loving Father, we can risk hoping in Jesus‒who is and always will be our eternal hope. 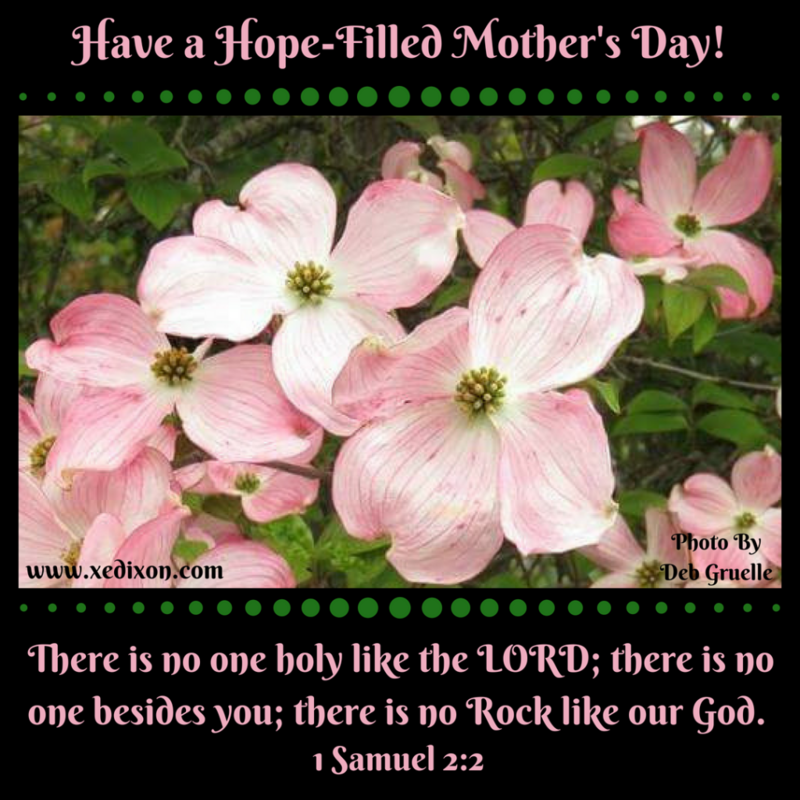 Lord, thanks for reminding us that You are our only true hope, so we can never truly lose hope. Please fuel us with the peace of Your enduring love. In Jesus’s name, Amen. How can placing our hope in Christ, who is unchanging and faithful and just, help us when our current situations feel hopeless? In what situation have you been afraid to hope or hope again? Who has God used to encourage you to hope again? We Can Count on God . . . No Matter What! 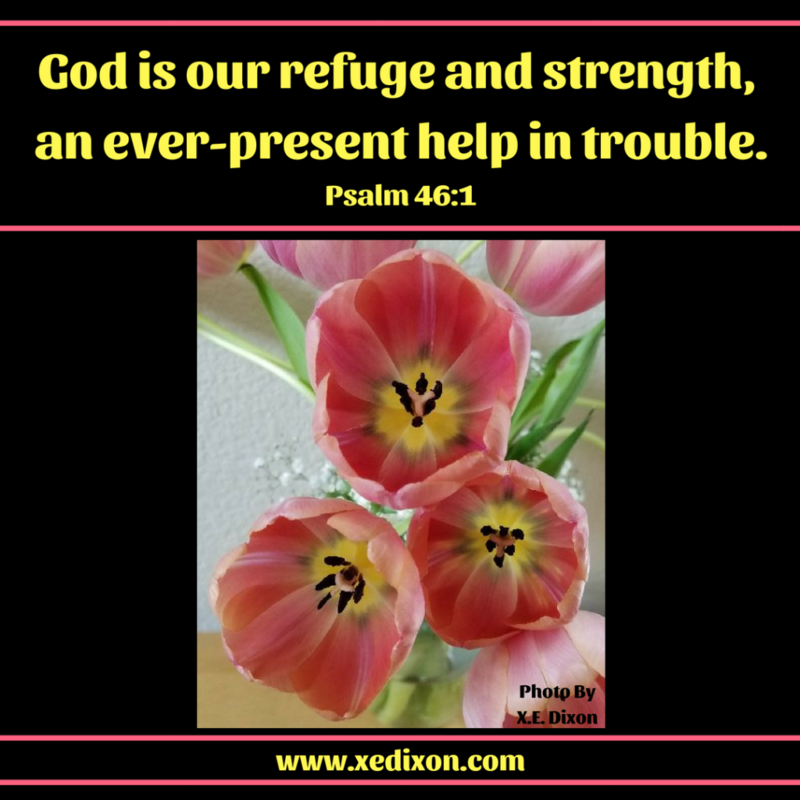 We don’t have to be overwhelmed with life-altering problems, suffering great loss, physically hurting, disabled by discouragement, or overwhelmed with worry to be tapping-our-foot-and-crossing-our-arms-impatient with God. We can feel desperate for a breakthrough, even when we’re not quite sure what we’re hoping to break through. How can our weary-of-waiting souls be refreshed when we can’t hear past our own exasperated grumbling, whining, or exaggerated sighing? How can we glimpse hope when we can’t see past our hand-painted murals of if-onlys and what-ifs? How can we experience the joy of gratitude and contentment when we’re scribbling comparisons and complaints in tattered wish-my-life-were-different notebooks? Sometimes, all it takes is a slow drip of discontent to tempt our eyes to wander over our neighbor’s fence. After my health took another dive, my slow drip of discontent burst into waves of disheartenment crashing against the weathering rock-wall of my resolve. When will things get better? What else can go wrong now? Will I be able to take much more? Even the minor inconveniences felt like huge blows. Yet, with a loving outpour of mercy, the Holy Spirit reminded me of a man of great faith who endured immense personal devastation, who persevered through unfathomable suffering. Job. 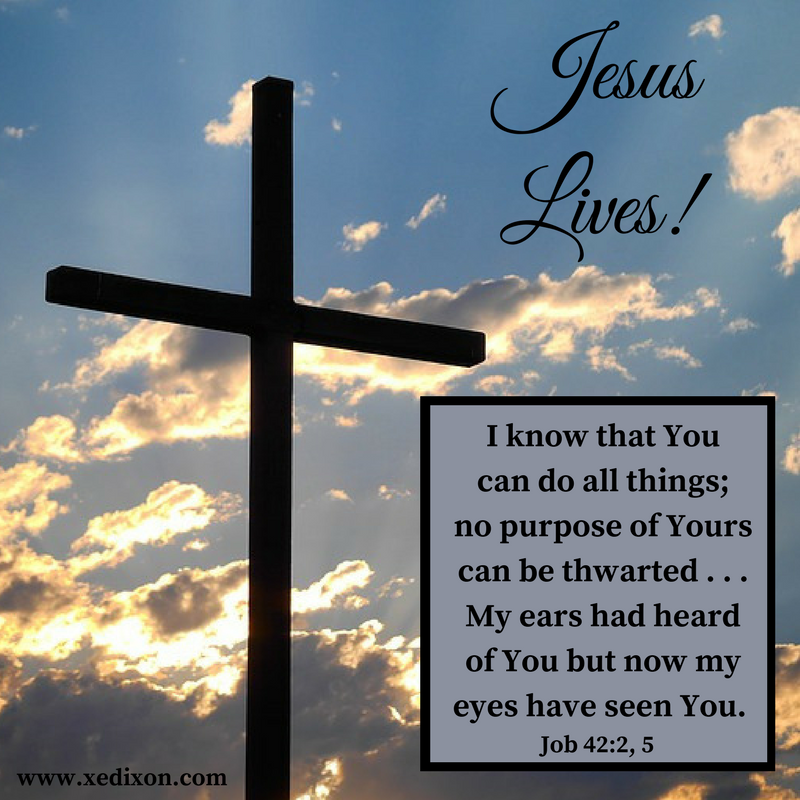 When life’s circumstances socked him in the gut, punched him in the jaw, stomped on his head, and busted down the door to his grieving heart, Job spoke honestly to God. Approaching the Lord with raw emotions and hard questions displayed Job’s depth of faith. How did the Lord respond? Scripture says He spoke to Job “out of the storm” (Job 38-41). God didn’t explain Himself, reason, or promise to comfort to Job. He simply invited Job to reflect on the unquestionable majesty of His Creator and Sustainer of all. Did Job wrestle with the reality of God’s bigness . . . of his own smallness? I know I have. Did he cry out in awestruck wonder when the Lord listed the evidence of His glory? I know I do. Everything . . . including all of His beloved children. And God cares for those He loves. Job’s circumstances didn’t change. He didn’t wake up and realize his devastation was just a dream. His grief hadn’t faded or gotten easier overnight. The confirmation of God’s grandness and Job’s smallness both comforted and humbled him. If we’re not careful, we can misinterpret this beautiful interaction between the Father and His beloved servant. We can fail to recognize the Lord’s incredible mercy. After Job submitted to God, the all-powerful, all-merciful, and all-loving God lifted him to a place of honor as a servant, an intercessory prayer warrior (v. 8). He accepted Job’s prayers on behalf of this friends (v. 9). The Lord restored Job. He “gave him twice as much as he had before” (v. 10) and “blessed the latter part of Job’s life more than the former part” (v. 12). God wasn’t trying to replace what Job had lost. Even after the Lord blessed him in abundance and empowered him to move forward, Job still had hard days . . . just like all of us. Some days were harder than others. Some days were merely filled with little frustrations. The only constant in his life, in this life, in our lives . . . is God. Whether we’re feeling inconvenienced or crushed by the complications life tosses our way, the Lord doesn’t compare us or our circumstances with others or measure our hurts against the hurts of others. When we’re feeling forgotten in the wait or beat up by life, when we’re tempted to slip into discontent, our loving Creator and patient Sustainer continues to love us, extends grace, and remains faithful. Jesus loves us and remains with us through every trial. He meets our deepest needs and increases our compassion for the hurting. He strengthens and heals us‒according to His perfect plan and pace. As Easter approaches, we can reflect on God’s grandeur and the priceless sacrifice Jesus made on the cross. We can rejoice and place our eternal hope in Christ, our Risen King, as we celebrate Resurrection Day. We can count on God, no matter what, because He is and always will be unchanging, unlimited, and undeniably faithful. Nothing . . . nothing . . . nothing can thwart the power of our Lord’s sovereign plan or throw a wrench in His flawless pacing. Lord, thanks for giving us Your Word and being the foundation on which we stand, no matter how rough the road ahead feels or how long the wait seems. Please help us rest in the unshakeable peace of Your constant presence. In Jesus’s name, Amen. Don’t Worry! God Knows We’re Weak! Over the years, people have asked for prayer and apologized as they admitted struggling with worry, which usually stems from doubt and fear. Scripture affirms we have no reason to feel guilty or be ashamed in our weak moments. We’re only in week two of the Our Daily Bread Bible in a Year reading schedule and we’ve watched quiet a few worry-warts processing their feelings and then persevering under God’s care. Eve worried the Lord was holding back on her, while Adam feared taking responsibility for his actions (Genesis 3). Abram worried God wouldn’t protect him if the Egyptians found his wife attractive (Genesis 12:10-20), and later, she doubted the Lord would keep His promises (Genesis 16:1-6). The name changes didn’t stop them from wrestling with worry. Abraham claimed Sarah was his sister . . . again . . . when he had a run-in with Abimelech (Genesis 20:1-3). Their son, Isaac, followed their fearful footsteps and lied about his wife being his sister when he settled in Gerar (Genesis 26:9-11). The line of worriers didn’t end there. Isaac’s son, Jacob, feared he wouldn’t have enough and deceived his father while stealing from his brother . . . with his mom’s help (Genesis 27). We could claim these folks straddled the line between faith and fear-based worry because they hadn’t met Jesus face-to-face. 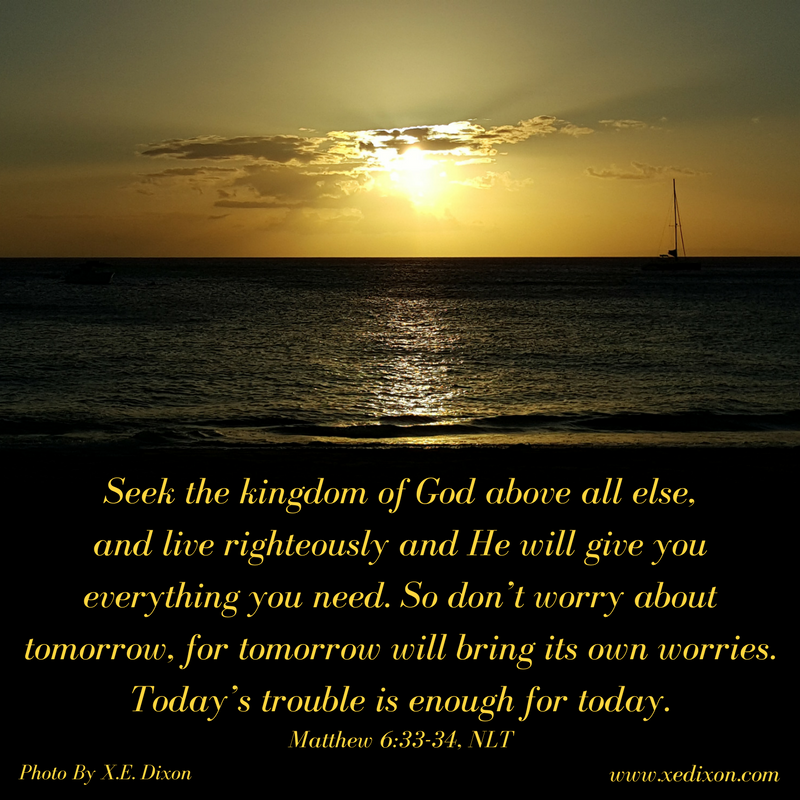 But the disciples wrestled with a fair share of worrying, too. They walked and talked with Him every day. Yet, Jesus still found it necessary to teach about the anxious, fearful worries that often stemmed from unbelief. Why? Because our Lord and Savior knew we’d need assurance of His sovereign goodness and loving care. Though Jesus warned about placing prosperity on the tippity-top of our priorities list (Matthew 6:19-26), His red-flag led to a comforting promise of His ongoing provision and protection. 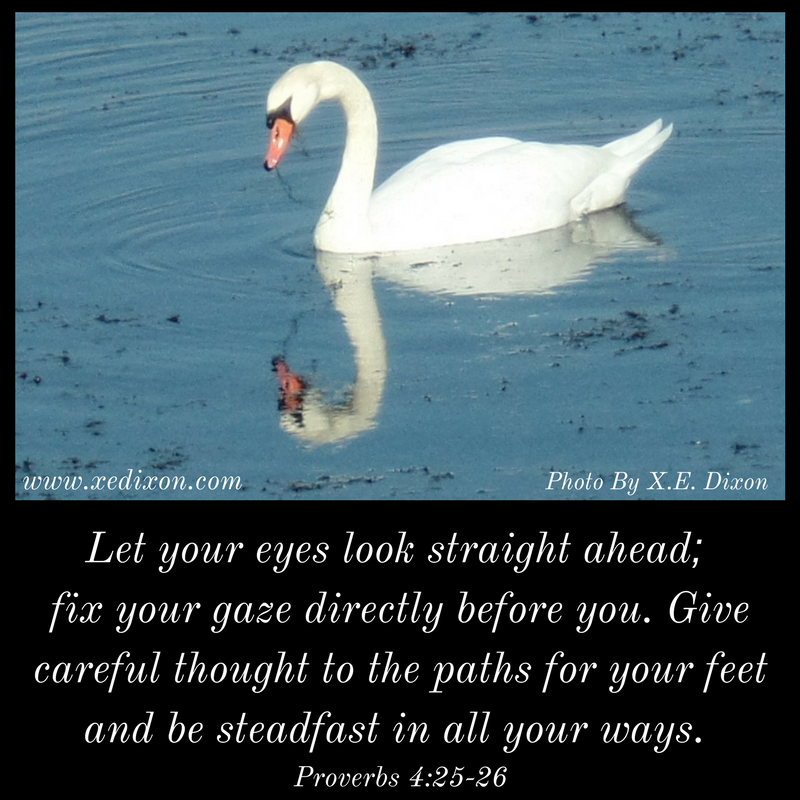 When my husband lost his job a few years ago, these verses took on a whole new meaning. Sure, it’s easier to proclaim our trust when we’ve got a safety net in a savings account and a steady income. But when we can’t save ourselves, when we can’t fix a situation, God is still able to do above and beyond all we can imagine. Hallelujah! While God provides for our needs and affirms His power as Creator and Sustainer of all, He also assures us that life isn’t centered around what we can consume or wear (v. 26). He invites us to consider the futility of anxiety, the wastefulness of allowing worry to dominate our thoughts. In my experience, the answer is nope-not-a-chance-and-in-your-dreams. Obsessive worry can actually steal our peace, smother our joy, and even cause health and relational problems. When we experience hard times, when situations work out in ways that seem unfair and sad in this world, worry has a way of sneaking up on us. It’s tempting to fret, especially when we or the people we love seem to be buried under the growing burden of financial strife, physical suffering, or emotional trials. What about the homeless and those who suffer in other countries? If we start listing all the things beyond our control, of course we’ll be whacked over the head with worry. Focusing on our endless limitations and inability to fix everything, may lead us to a form of idolatry when we shove God into the margins of our lives and become obsessed with excessive worry, anxious thoughts, and fear. This is much different from being concerned and planning to be a good steward of our finances and health, as a responsible adult. Don’t worry! God knows we’re weak and has planned accordingly. He knows we’ll worry, fear, doubt Him, and have anxious thoughts. But in our weakness, our loving Lord and Savior remains strong. He invites us to seek Him first when we’re in need (v. 33), living in this moment as we walk by faith and hear His voice assuring us, guiding us, and eventually washing our worries away. When we come to the Lord honestly, He can bring us peace, even when we don’t get relief. Lord, thanks for the empowering us to trust You’ll carry us through every moment in our lives, as we remember You ordained our days before one of them came to be. In Jesus’s name, Amen. To receive daily encouragement devotions from Our Daily Bread and join me in reading the Bible in a year, using ODB’s reading schedule, please click here. At the end of November, my physical and emotional endurance waned. I praised God for some exciting ministry opportunities He’d brought my way. I thanked Him for helping me through some tough but necessary relational changes in 2017. He’d empowered me to support some friends through heartbreaking situations and provided in surprising ways as He helped our family process unexpected health setbacks. Though I continued trusting the Lord, my prayers began to sound repetitive. Feeling like I needed a drastic change and spiritual refreshment, I asked God to wrap me in peace as I sat in His presence. Day after day, He affirmed that I didn’t need a change. I needed continual reminders of His unchanging character and the consistency of His persevering promises. My husband and I committed to connect with God daily by using the Our Daily Bread Ministries Bible in a Year Reading Schedule. I chose to read an unfamiliar translation, to help me prevent skimming through familiar chapters. Even though we’ve read through the Bible yearly since 2005, I had a hard time waiting for the start date. If I wanted to thrive, instead of hoping to just survive in 2018, I needed more of God! Over the last week, I’ve inhaled peace and highlighted verse after verse that affirmed the trustworthiness of God’s persevering promises. The Holy Spirit tugged my heart toward repentance, as I realized I’d been worrying through the wait when I was weary from battling chronic pain. How are You going to provide, Lord? What am I going to do now, Lord? How much longer? How much harder? Before I realized it, I was wah-wah-whining. At this point, I thanked the Lord for my husband. When one of us is weak, the other is strong. When he wants to jump in and fix things, I encourage him to rest in God’s presence. When I want to rush God along for fear of Him not coming through like He has every time in the past, my hubby reminds me to be still and trust. Praying for an increase of faith during a rougher-than-normal week, I reflected on Abram’s responses to God at different times during his waiting journey. When Abram first received God’s call, he didn’t even hesitate to follow Him into the unknown (Genesis 12:1-6). Abram accepted God’s promise (vv. 7-9), though he often struggled with fear (vv. 10-16). The Lord remained faithful (vv. 17-20) and reassured Abram of His persevering promises (Genesis 13:14-16; 15:4-6). Unfortunately, Abram chose passive complacency instead of reminding his wife of God’s trustworthiness. Sarai refused to sit still on the sidelines. She hopped up and took the reins away from her husband and God, worrying her way through the wait. When the Lord didn’t meet Sarai’s standards, or work according to her preferred timeline, she forced her own way and opened the door to generations of conflict (Genesis 16). The Lord stayed true to His Word, affirming the now-99-year-old Abram wasn’t forgotten (Genesis 17:1-2). He transformed Abram and Sarai, beginning with their names (Genesis 17:5, 15), though it seemed He knew His servants still weren’t ready to receive the fulfillment of His promises. They wanted instant gratification and quick relief. I’ve been there! The Lord must have known they needed time to grow as His plan played out. He waited another year for Sarai, now Sarah, to give birth to Isaac (Genesis 17:21). Oh, how many time I’ve compared my timetable to God’s, as if I could see the future or control my circumstances. I’ve begged for relief, to be whisked out of the wait, without even realizing I’d be missing out on the rewards God was carving out for me. 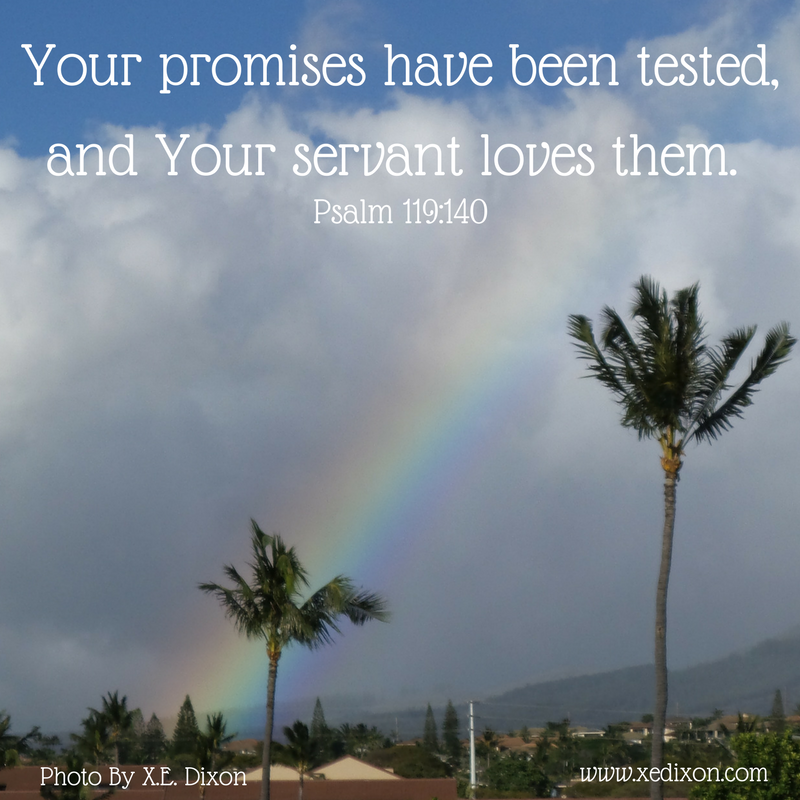 As we remember the Lord’s consistent character, we can rely on His persevering promises. He will comfort our hurting hearts, strengthen our resolve, prepare us for the path He’s paved for us, and help us to stop worrying through the wait . . . if only we take time to listen to His words and remember He stays true to His Word. Lord, thanks for blessing us with the privilege of communing with You through the Bible in a Year reading schedule. Please help us trust Your plan and pace are perfect. Help us secure our hope in Your sovereign goodness, unfailing love, infallible Word, and persevering promises. In Jesus’s name, Amen. Are you more like Abram, Sarai, or a mixture of both when trusting God through the wait? How has God helped you wait without worrying or wah-wah-whining when you were weary, tempted to rush past the Lord, or determined to force God’s hand by demanding your own way? To receive Our Daily Bread devotions with the Bible reading schedule, please visit our website and subscribe today. I look forward to growing with you! I Want to Know You More, Lord! The first time I read the Bible, I acted like a giddy schoolgirl. I couldn’t believe God’s story, His actual history, was available for me to read. The more I read, the more I realized the Bible was more than just another book. I can’t get enough of God’s Word and I can’t stop sharing His truth and love with others! When I share that my husband and I have read through the Bible in a year since 2005, people have asked me several questions. How can you finish that huge book in one year? When following most Bible-in-a-Year schedules, the daily readings only take 15-30 minutes per day. We can break up the readings or savor the day’s planned chapters at one time, depending on our personal preference, our reading speed, and our available time. The important thing is remembering we’re not just reading. When we open up our Bibles, we get to spend time listening to God’s voice. Hallelujah! Why are you so excited about reading a book that’s so boring and no longer relevant? Talk about an amazing start for the greatest story in history! The Beginning and the End, the Creator and Sustainer of the Universe, the Maker of time itself . . . God . . . created every single thing in the heavens and on the earth. As if that’s not enough, the God-breathed words of Scripture records God’s story and ends in the most thrilling cliff-hanger . . . Jesus will come again. Hallelujah! While we wait, we’re invited to know Him, love Him, serve Him, and be known, loved, and forever changed by Him. If you’ve read the Bible once, why bother reading it again? Every year, I learn something new, love the Lord more, and accept the fullness of His love for me more. Whether God has changed my heart, my perspective, or my situation, His infallible truth remains the same. Through the power of His Holy Spirit, He reveals His immutable character and His unchanging plan and promises through His Word and equips me for what He has prepared for me each day. I need to connect with my Maker, my Sustainer, my loving and good Father every single moment of every single day. What do you do when you don’t understand what you’re reading? Faith isn’t about me being able to completely comprehend my eternal and sovereign God. We can ask Him to help us understand and trust Him. 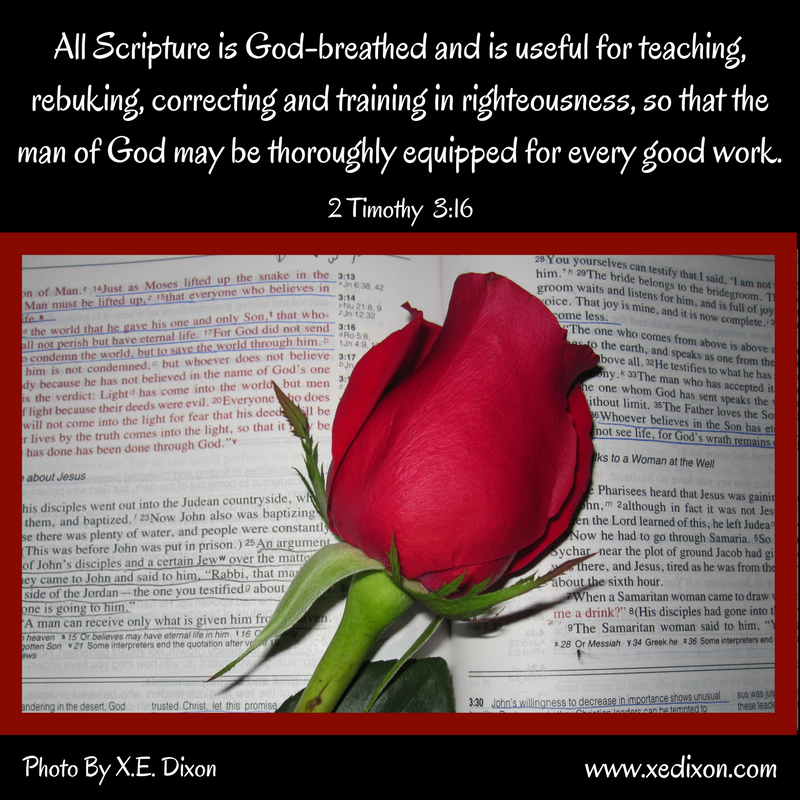 In His goodness, He provides resources to study Scripture, with the help of His Holy Spirit. Why don’t you read smaller chunks so you can study deeper? I do! I read through the Bible in a year for familiarity, to learn how His whole story connects from the Old to the New Testaments and into my life. For deeper study, I use resources, like concordances, commentaries, and word studies. Most importantly, I begin with prayer and invite the Holy Spirit to change me and make me more like Jesus. How do you keep your reading from feeling like something you’re just checking off a list? When we’re reading the Bible, we’re spending time with God. While we read Scripture, we’re experiencing God’s presence and hearing His heart beating with every syllable. We can commune with the Lord, talking to Him through prayer and listening to Him by reading the words He inspired and preserved in the Bible. What a wonderful gift! How do you keep from giving up, especially if you fall behind? When we’re focused on nurturing our relationship with God, we don’t have to worry about our performance. Perfection is not possible or expected. If we miss a few days, there’s no reason to feel pressured to catch up or to succumb to discouragement and give up. We can just brush off those guilty feelings and enjoy God’s abundant and all-sufficient grace. Our time with God is as personal as our relationship with Him. As we spend quiet moments with Him, we can come as we are and ask Him to increase our desire to spend time with Him every day. Why should we bother reading Scripture with a reading schedule? Lord, thanks for the privilege of hearing Your voice, placing our prayers in Your hands, and growing closer to You and others as we bask in Your endless love and saturate our hearts with Your truth every single day. In Jesus’s name, Amen. Have you read through the Bible? What have you enjoyed about daily Bible reading? about reading the Bible in a year? What is the greatest challenge you’ve faced and joys you’ve experienced while following a Bible reading schedule? To join Alan and me in reading the Bible in a year with the Our Daily Bread schedule, please click here. If you’re going to choose another daily Bible reading schedule, please let me know. I’d love for us to pray for one another, as we seek the Lord through His Word and love Him with all we’ve got!